Water security means water is effectively and holistically managed to support human well-being, socio-economic development and the environment, with an emphasis on ensuring equitable access to safe water and sanitation for the very poor, the vulnerable and disaster-affected populations. In 2018, the United Nations estimated that roughly 3.6 billion people live in areas vulnerable to water scarcity and that number could reach 5.7 billion in 2050. Climate change, over-extraction of water from aquifers, and contamination of surface and groundwater all threaten ecosystems and freshwater availability. In nearly every part of the world, water is being polluted at a scale that threatens human health and economic development—for ourselves and for future generations. The ramifications of water resource loss are staggering. Innovative, scalable, adaptable, resource-neutral and gender-responsive water, sanitation and hygiene, or WASH, services. Improved, more equitable and inclusive water governance that increases financial investments in water. Globally, women and girls carry the primary responsibility for domestic water supply, are at increased risk of violence due to poor access to water and sanitation, often have limited ability to sustain services due to poor purchasing power and have limited rights over water resources and decision-making authority concerning water use. Women are disproportionately affected by natural and man-made disasters in a host of ways. At the same time, “women also play a crucial but often unrecognized role in managing water for livelihoods and food security 1,” where women account for 43% of the agriculture workforce. 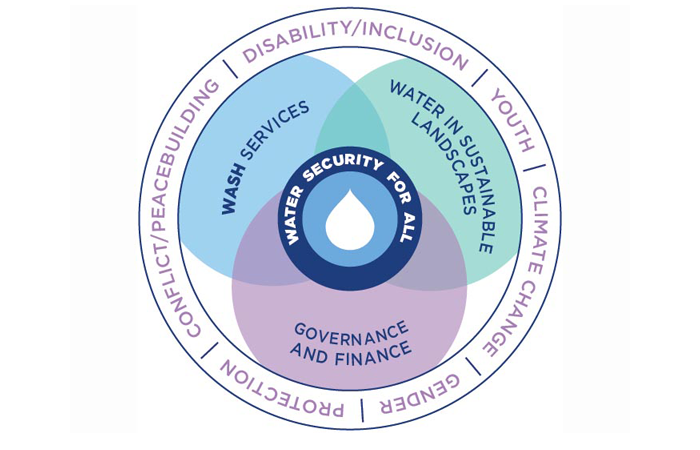 Water security programming at CRS recognizes that inequalities faced by women and girls undermine their development and therefore adopts a mainstreaming approach to ensure gender equality is included in all activities. The World Health Organization reports 844 million people don't have access to safe water. About 2.3 billion people are living without access to improved sanitation. That means 1 in 9 people on the planet don't have clean water close to home. One in 3 don't have a decent toilet. Our diverse programming seeks to improve the health, future and environment of the people we serve. Impact/By the Numbers: Provided support to more than 8 million beneficiaries through 62 projects in 32 countries.